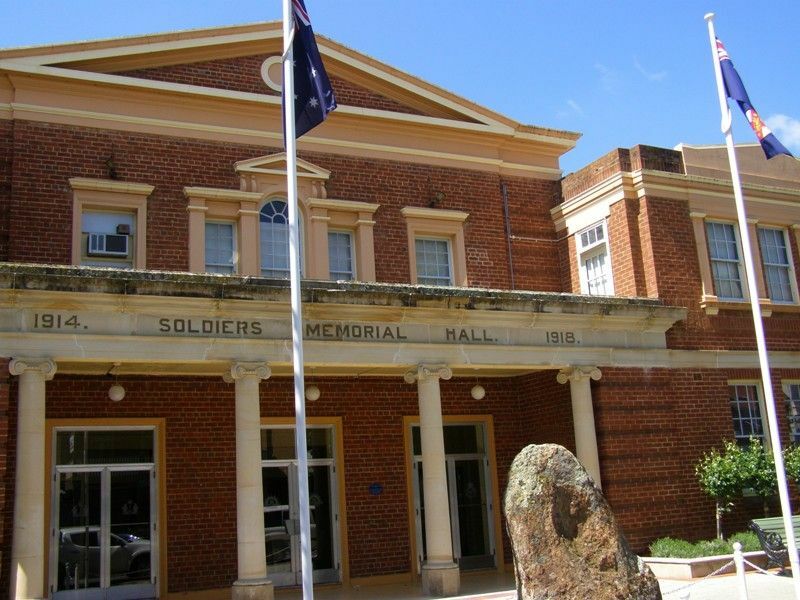 The Soldiers Memorial Hall commemorates those who served in World War One. 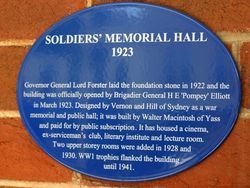 Governor General Lord Forster laid the foundation stone in 1922 and the building was officially opened by Brigadier General H E 'Pompey' Elliott in March 1923. 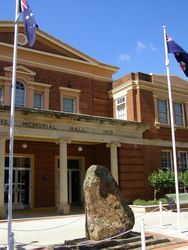 Designed by Vernon and Hill of Sydney as a war memorial and public hall, it was built by Walter Macintosh of Yass and paid for by public subscription. 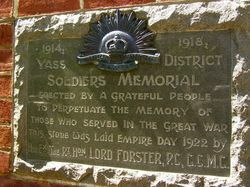 A Soldiers' Memorial Hall at Yass is now in course of construction, Messrs Vernon and Mills are the architects and the builder is Mr Walter Mclntosh, of Yass. The hall will be one of the finest of its kind in the State. Set back in picturesque fashion from the street on a 100ft. block, with garden plots, the building will have a frontage of over 88ft. It is being built of brick and faced with stone dressings. A portion supported by stone columns leads to a public vestibule, where it is proposed to hang memorial tablets. The floor of the vestibule is to be finished in Mosaic tiles. On either side of the vestibule are located cloak rooms, and a marble staircase leads to a gallery and club room. The hall proper will be 60ft by 40ft. and with the gallery will seat 683 people. The Burrowa News (NSW), 5 May 1922. 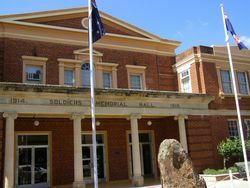 The Soldiers' Memorial Hall at Yass was opened by Brigadier-General Elliot during the week. A march of returned men took place through the town, and the hall was crowded. 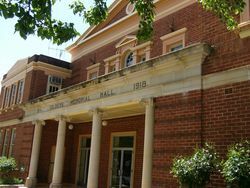 General Cox appealed for funds to complete the hall, and succeeded in obtaining £1400. Mr. A. B. Triggs has contributed £1000 since the fund was opened. Sunday Times (Sydney), 11 March 1923. THOSE WHO SERVED IN THE GREAT WAR. His Ex. The Rt. Hon. LORD FORSTER, P.C., G.C.M.G.